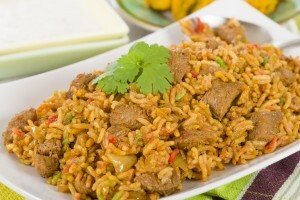 One of the mutton rice (biryani) recipe from the wide range of biryani in Asian cuisine. Tender meat cooked with aromatic spices and rice makes it a special and very tasty dish. This recipe will make a perfect meal on special occasions. Serve it with the cucumber raita and ENJOY this dish with your guests, friends and family. Wash and soak rice for about 30-45 mins. Wash the meat and cook in plenty of salted water until tender. Make sure that almost all the water dries out by this time. Heat oil in a pan on medium flame and fry onion till brown in color. Add garlic and fry till fragrant. Lower the heat, add tomatoes and green chilies to the pan, cover and cook till the tomatoes are tender and oil comes up. Mash with a masher. Add the yogurt, ginger, and all the spices and cook till the gravy leaves the oil. Add the tender meat and its any stock left, cook and fry for about 10 minutes on medium flame. Add all spice powder, mix well and switch off the flame. Add fresh cilantro and mint leaves. Meanwhile, cook rice in plenty of salted water till they are almost done, drain them and keep aside. Take a large pan, grease with 2 TBS oil, layer its bottom with boiled rice and then with the meat gravy. Sprinkle one third of the cumin seeds followed with the few lemon and boiled egg slices. Repeat this layering till all the rice and gravy is done. Cover the pan tightly and cook over very low flame for about 2-5 minutes or the rice are completely cooked. At the time of serving, mix the rice well, delicious mutton rice are ready to serve hot.